If you bookmark this page, you will always know where to find transportation to medical appointments in Miami, Florida. 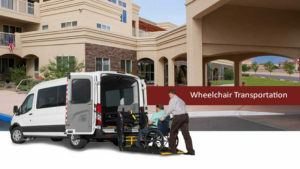 Our company sets the standard for hospital patient transport services in this area, and we take our commitment to the community very seriously. After all, your health is at stake, and we are in the business of doing everything possible to help you heal or maintain your wellness. This city is an extraordinary place to live on numerous different levels. Educational opportunities abound at highly regarded institutions of higher learning like Florida International University, Keiser University, the University of Miami, Johnson and Wales University, and Miami-Dade College, just to name a few. After graduation, there are countless career opportunities working for companies like American Airlines, Precision Response Corporation, Carnival Cruise Lines, and Florida Power & Light Company. Of course, there is no shortage of things to do in your spare time. South Beach is one of the most exciting destinations on the planet, and there are world-class golf courses, many parks, museums, concerts, and festivals to enjoy. As the icing on the cake, sports fans can urge on the Miami Marlins, the Miami Heat, and the Dolphins, and the University of Miami’s athletic program has always been top-notch. If you ever need transportation to a hospital in Miami, we can provide the ideal solution under any and all circumstances. Patient transport that requires a wheelchair equipped vehicle is available through our company, and we can accommodate gurneys as well. We can also be engaged to drop you off and wait if you are going to a hospital for a relatively brief outpatient vision. Hospital patient transport is a large part of our business, and you can rely on us for transportation to medical appointments at doctors’ offices, clinics, and other types of medical facilities. The bottom line is this: You tell us what you need, and our Miami, Florida patient transport team will make it happen. This is our promise to members of this fine community, and you can rest assured that we keep it 100 percent of the time. Speak With a Patient Transport Specialist Right Now! We are standing by right now to help if you need hospital patient transport services of any kind. You can speak with one of our Miami, Florida patient transport professionals if you call us toll-free at 855-263-7215, and you can also get in touch through our contact page.